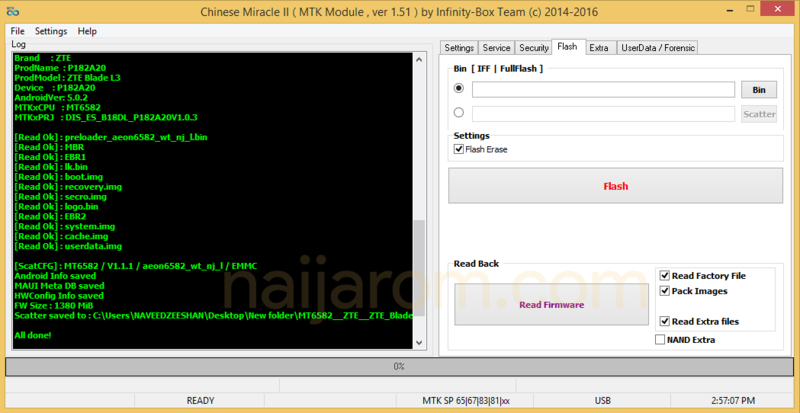 Infinitybox Chinese Miracle 2 MTK v1.51 is a small application for Windows Computer which allows you to flash the BIN File on your Mediatek Smartphone and Tablets in a click only. You can also flash Scatter based Stock Firmware on your Mediatek Devices with this tool. It also allows you to remove the Pattern Lock, Remove the PIN lock, Remove the password lock, Format the device, Clear the Cache data, Remove the Google Account, Remove the FRP, Flashing IMEI. [*] Other Versions: If you wish, you can download the previous version of Infinitybox Chinese Miracle 2 i.e v1.53, v1.55, v1.58, v2.00. [*] Credits: Infinitybox Chinese Miracle 2 MTK v1.51 is created and distributed by Infinity Box Team. So, full credits goes to Infinity Box Team for sharing the tool for free.